Arizona, I… I don’t even know what to say. A couple of weeks ago, if you remember, I wrote an ode to Arizona’s desert loveliness. Has the state now betrayed me? Last Friday, Arizona Governor Jan Brewer signed into being one of the most reactionary, racist laws in recent memory in Arizona. I won’t rehash the details of the “Support Our Law Enforcement and Safe Neighborhoods Act.” Suffice it to say that its illogic is mind-boggling, and the hate and cynicism that fueled its passage astonishing. Notwithstanding headlines that charitably describe the law as “tough,” there is already talk of boycotts and court challenges from different corners of the country. This law is going to be hard on Scottsdale’s convention industry. 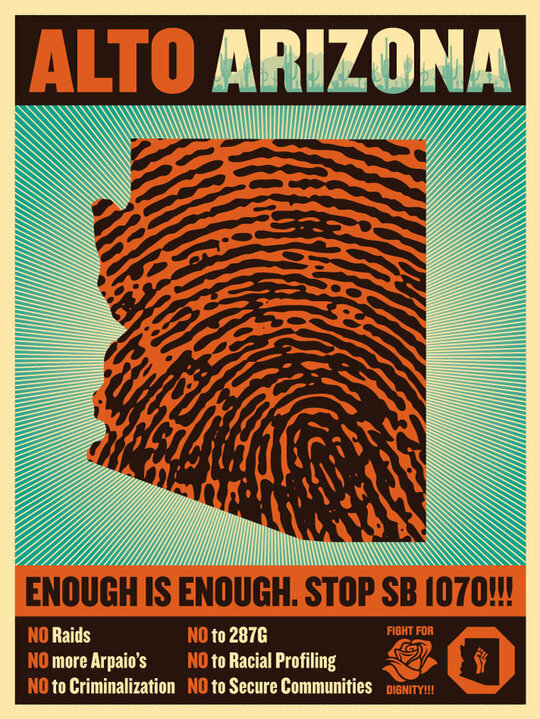 Arizonans are not the enemy — many of them will, in fact, be victimized by this law. Rather, the battle over bigotry is going to be won with the help of Arizonans — from libertarians to progressives to constitutional conservatives to migrant rights activists. They may have different perspectives on what a fixed immigration system will look like, but they can all agree that curtailing civil rights is a terrible solution. SB 1070 is an exaggeration of the fears that exist, to some degree, in every state in the union (with the possible exception of New Mexico — Borque cousins holler if I’m wrong about that). That makes it a national issue. Reactionaries and opportunistic populist Arizonan politicians, in their extremism, have laid bare the true dynamics of the immigration debate. And the battle brewing in the Southwest could force a break in the country. Shunning Arizona in the form of a business boycott is one way to show the strength of the opposition to the law. But I’ll also be asking my friends and relatives who say they are “so ashamed to be from Arizona right now” what we outside of the state can do to help and engage politically. They are the ones who will have to fight this law most directly — and the outcome of the fight could affect the entire country. Finally, make sure you watch Jon Stewart and company’s take. Ugh. Eamon, you may be too young to remember when Evan Mecham was governor of Arizona and refused to acknowledge an MLK Day here – the Super Bowl pulled out of Tempe, conventions were canceled, money was lost. Money, it seems, talk. So don’t come here, even to Tucson, which is totally grossed out by Phoenix and this dreadful legislature and governor. Tell everyone to stay away. Ironically, a small theater company south of Tucson opens next weekend a play based on a true story of an immigrant who crossed the border illegally, came across a car accident – the mother was dead, and a young child survived and was terrified. The immigrant stayed with the child until help came – which, of course, resulted in the young man being sent back to Mexico. The hate is so incredibly heavy. As an aside, please get this straight: Texas is not part of the Southwest.